I forgot to take a before pic, but just image a typical brown stained wooden table. I knew I had to add some beautiful colour to this amazing piece. Then distress to bring out all the gorgeous details. Look at those legs! I just drool. This is definitely another one of my favourite pieces! I love it! you will have to check out the one I just now posted a minute after you on my blog - almost same color - little table I found for my sewing room. What a fabulouse table! I love all of the deatails in the piece and your choice of turqouise is just beautiful! I am visiting from It's Overflowing party! Following you now as both a Linky follower and on GFC...have a great weekend!!! Love your table!! Just found your blog...love it! Can't wait to see all your other projects. So cute! I love the little feet on it. I have a thing for hall tables...how they just perch against the wall. I really like the bright turquoise. WOW! what a beauty! 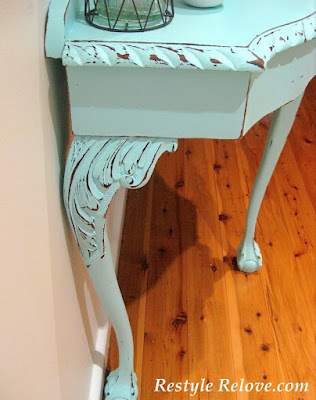 i love the color, the distressing, the shape, details! i'm drooling! Beautiful!!! 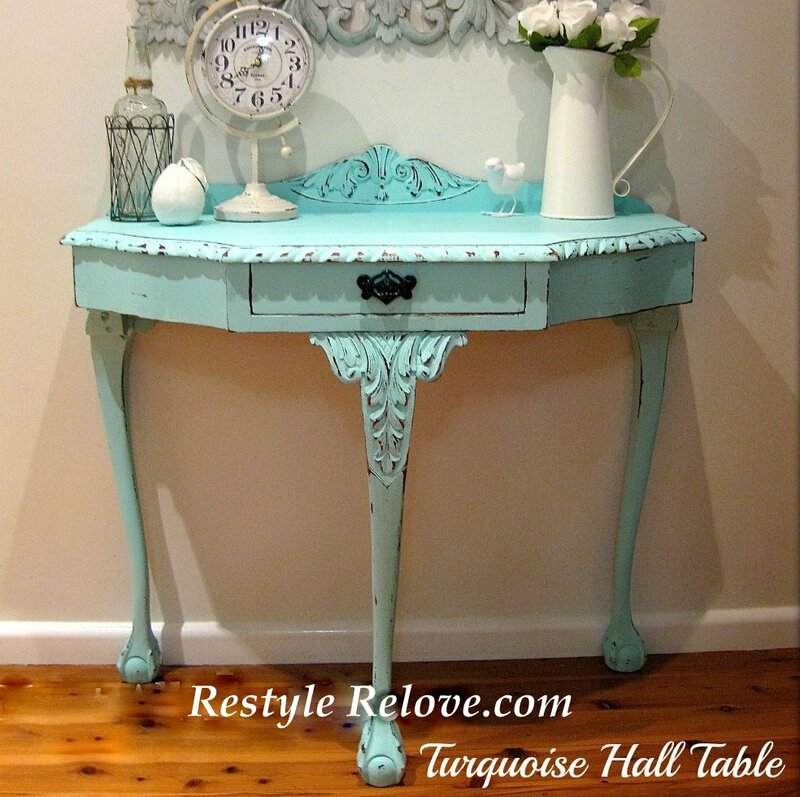 I love this shade of turquoise! Your latest follower. Blessings! What a greeting when you walk in the door! I absolutely love this piece! The shape, color and distressing are just gorgeous! I found your link on Primp and I'm now following your blog. I can't wait to see what else you do! 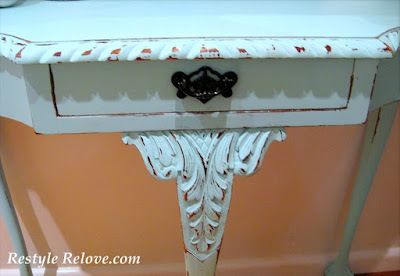 I just love the details on this table....and all of your WHITE items on display really set the piece off nicely! Thanks for sharing. Stop by to visit with me anytime. 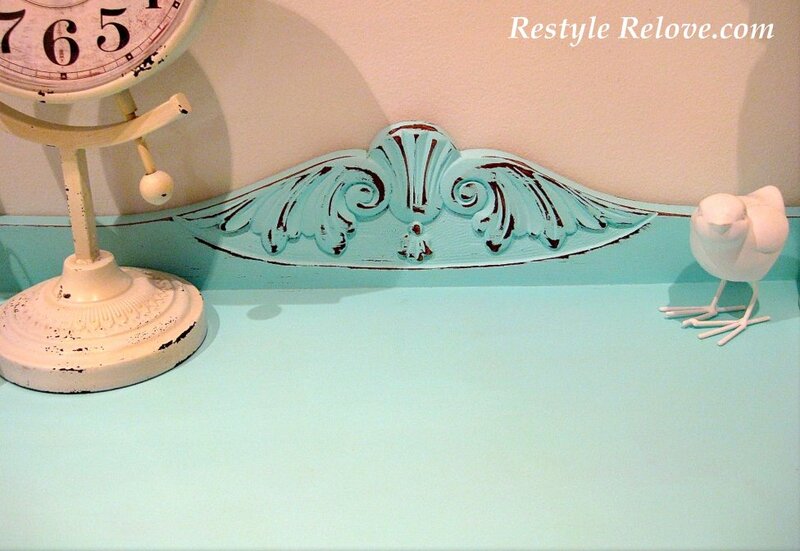 I love what you've done with the table, the color is so beautiful! I'm visiting from the Crafty Blog Stalker party. That is gorgeous! From color to the structure of the table itself! How did you do the distressed effect? swwooooooooooooooooon!!!!! My favorite color ever! I just die. I love love love that table! That color is awesome. Is it chalk paint? Would love to know the color name. You did a lovely job on this! So gorgeous! Very pretty colour. So beautiful! You did a great job with the distressing. Gorgeous!!! Every time I see this color I fall more in love with it. You did a fantastic job! I love that color and great distressing! Gorgeous colour Julie. 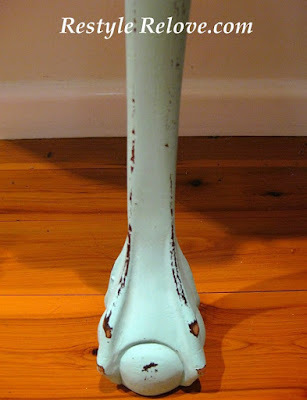 The table has such sweet shaped legs. Thanks for linking to Shabbilicious Friday this week.